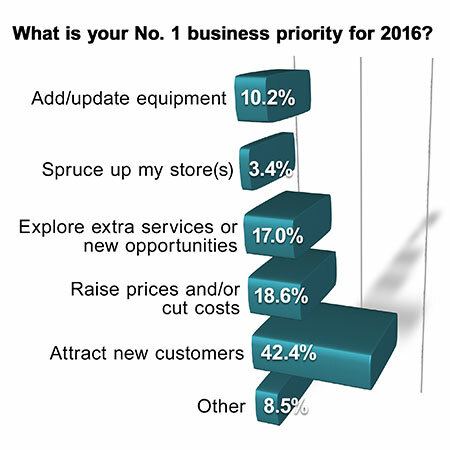 CHICAGO — Attracting new customers is the top 2016 business priority for the majority of dry cleaners (42.4%) polled, according to results from this month’s American Drycleaner Your Views survey. Other dry cleaners say their top priority is to “raise prices and/or cut costs” (18.6%), “explore extra services or new opportunities” (17.0%), “add/update equipment” (10.2%) or “spruce up [their] store(s)” (3.4%). The remaining 8.5% of dry cleaners surveyed listed “other” top business priorities, such as improving staff, informing clients of service diversification, and paying off land and building loan by the end of the year. 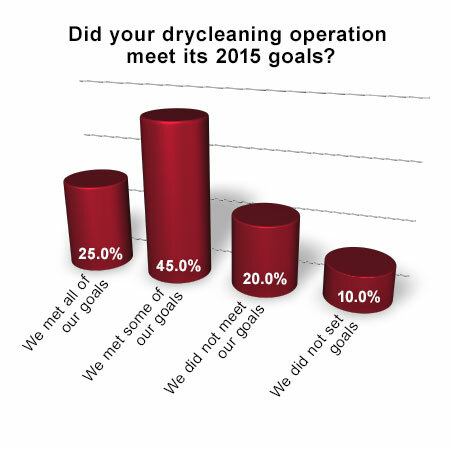 Looking back at 2015, 45% of cleaners say their drycleaning operation met “some” of its goals, while 25% met “all of [its] goals.” Twenty percent “did not meet [its] goals,” while 10% set no goals at all. No one who took the survey chose “quit smoking/drinking” as their No. 1 personal priority. The majority of dry cleaners are optimistic about meeting their business and personal priorities for the new year, as 49.2% say they have a “good chance [to] accomplish both goals.” Roughly 27% say they have a “50/50 chance,” while 18.6% say “there’s no doubt” they will accomplish their goals. The smallest share believes they have a “slim chance” (5.1%); no one who took the survey believes there is “no chance” they will accomplish their 2016 goals. While American Drycleaner’s Your Views survey presents a snapshot of the trade audience’s viewpoints, it should not be considered scientific. Qualified subscribers to American Drycleaner e-mails are invited to participate in a brief industry survey they can complete anonymously. Due to rounding, percentages may not add up to 100%.